Looks awesome! Congratulations on your happy Dance! What a Happy Dancing for you!!! 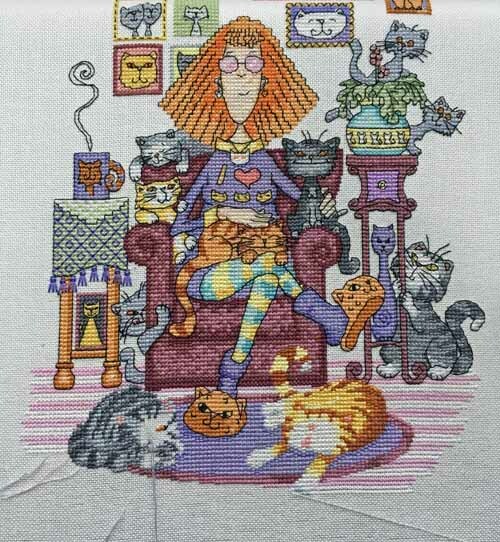 I love this embroidery with all the cats and the cat lady!! Gorgeous!!! Looks brilliant now that the cats all have their faces. Congratulations. Congratulations on a fantastic finish! I am not generally a cat person (severe allergies), but I love this piece. Beautiful work! I look forward to seeing your next project. Congratulations on the finish! I love all of those kitties — and I agree about the side-eye the grey tabby is laying on that slipper!!! I’ll miss seeing new cats appear, but look forward to seeing what you work on next! Thanks. It would have been a real challenge on aida, that’s for sure. Congratulations!! 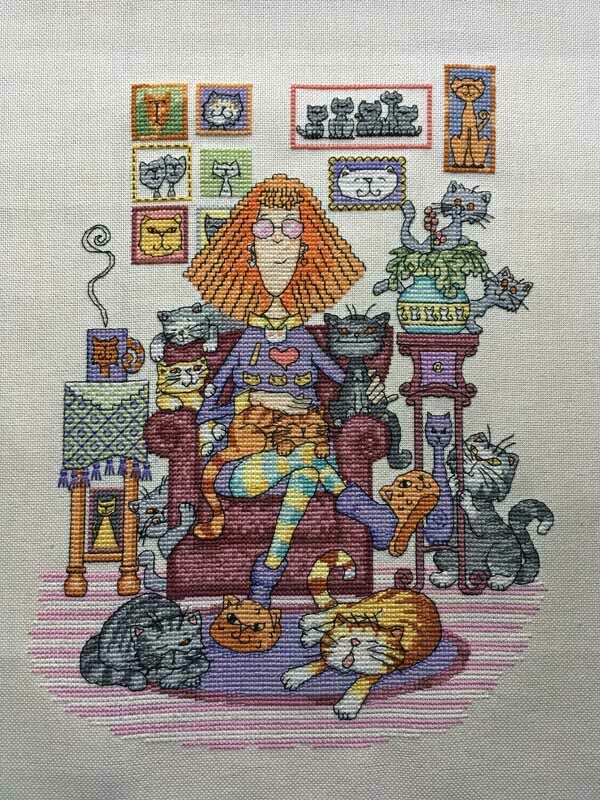 She looks great and I love all her cats! Growing up, that was our family. As kids, my sister and I, took in every stray that crossed our path! Carole, Congratulations on the finish! It is adorable. Yey! Well done on another super finish 🙂 You can always spot a quality kit when it has a separate back stitch chart I think. It’s been fun to watch this one grow. Thanks. I’d definitely do another kit by Heritage. I was really impressed by the clarity of the charting. Horray on the happy dance ! This was a very fun project to watch grow, and I love your choice of fabric – I use white zweigart evenweave for most projects (or whatever is supplied with the kit) but I never find I get such a lovely result. Perhaps I need to be more daring with my choice of fabrics ! I love using different fabrics. Sew and So have a brilliant selection. For most projects I use evenweave, but sometimes I get a nice slubby linen as I love the way it looks. Yay! Happy dance! It looks so eclectic and fun. I’m looking forward to seeing what you’ve picked for next time! This one always makes me smile or even laugh out loud, so many details to enjoy! That gray cat…😂 Congrats Carole! Good work! You know, it really doesn’t need a title, the subject speaks for itself! I have three cats too. One of them is a beautiful red tabby and is often referred to as the Ginger Ninja. Aw I do love ginger cats, ours has a crazy streak in him, especially on a full moon but he is a great character. Well done on a great finish! It looks fabulous and I’ve really enjoyed this piece! well done on a fabulous finish! It’s been fun to watch you stitch this one.